Teeth enamel discoloration can be caused by staining, tooth decay, aging, old amalgam fillings ,dietary and smoking habits which can damage the teeth. Some of the more common causes of teeth discoloration are medications, coffee, tea or cigarettes. Aside from staining, there are other factors that can affect the color of an individual's teeth. Genetics can play a role. Some people have naturally brighter enamel than others. Disease can also be a factor and certain medications can cause a discoloration of the teeth. Scaling and Polishing regularly by your dentist or hygienist helps keep your teeth and gums healthy and your smile whiter. Scaling removes the hard tartar which cannot be removed by brushing. Stains from coffee, tea, cigarettes or red wine are removed with the polishing. We provide sodium bicarbonate-based jet polishing on a private basis which is used for extremely stained or smokers teeth. Although the average treatment time is about 4 to 6 weeks, you may notice results after just a few days. If you have decay, be sure to have your teeth treated prior to bleaching. 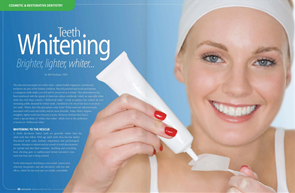 Patients who are not good candidates for in office bleaching because of tooth sensitivity, time restrictions, or financial considerations can often be helped with home bleaching. 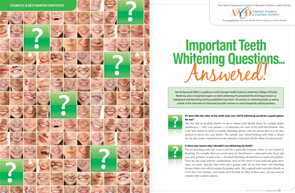 For most patients, a combination of home and in office bleaching yields the best results. You may need a "touch-up" bleaching session every 6 to 12 months. Do not use any home bleaching product if you are pregnant or nursing a baby. Avoid smoking and stain-causing foods (e.g., coffee and tea). 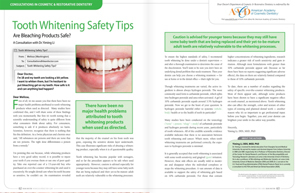 Avoid use of ultrasonic scalers and air abrasives during hygiene office visits. Avoid biting down with front teeth, especially on hard foods. Take special care when biting into or chewing hard foods. See dentist for resealing of margins as needed. Have a professional cleaning at least 3-4 times per year and yearly fluoride treatment. Ask your dentist to recommend a fluoride toothpaste and mouthwash for home use. Surface stains easily removed Deep yellow stain can be considerably lightened; brown and gray stains are much more difficult to bleach. Immediate masking of stains Glazed, natural appearance and effective masking of stains. Can achieve the best results in tooth shade, shape, and size. Extremely good bond to enamel. Minimal staining and loss of color or luster. Less tooth reduction required than crowning. The dentist can improve shape of teeth. Last longer than any other restoration. Natural tooth color may not be restored. Can cause discomfort if large tooth pulp present. Only 85% effective in selected cases. Extended treatment time may be necessary. May not achieve the whiteness you desire. Has a limited esthetic life. May not cover dark stains well. May involve minor tooth reduction to remove some of the stains. Gum irritation may occur if margins are imperfect. Margins may "wash out" and require repair. Unsightly line may appear at junction between tooth and crown if tissue shrinkage occurs. Much more expensive than bonding.